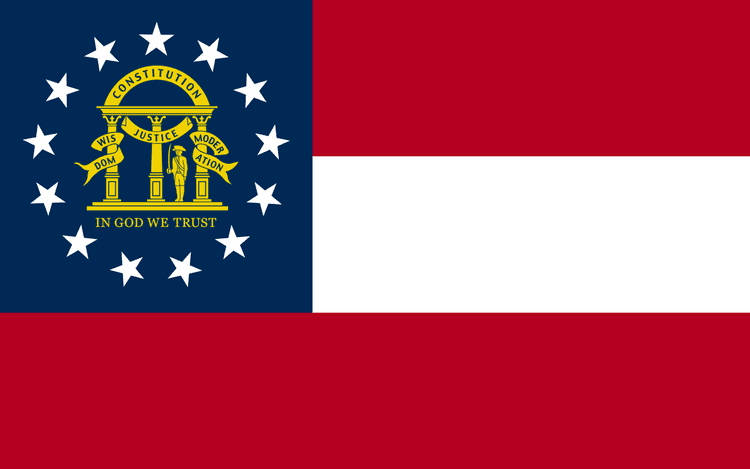 Georgia (/ˈdʒɔːrdʒə/ JOR-juh) is a state in the southeastern United States. It was established in 1733, the last of the original Thirteen Colonies. Named after King George II of Great Britain, Georgia was the fourth state to ratify the United States Constitution, on January 2, 1788. It declared its secession from the Union on January 19, 1861, and was one of the original seven Confederate states. It was the last state to be restored to the Union, on July 15, 1870. Georgia is the 24th largest and the 8th most populous of the 50 United States. From 2007 to 2008, 14 of Georgia's counties ranked among the nation's 100 fastest-growing, second only to Texas. Georgia is known as the Peach State and the Empire State of the South. Atlanta is the state's capital, its most populous city and has been named a global city. Georgia is bordered to the south by Florida, to the east by the Atlantic Ocean and South Carolina, to the west by Alabama, and to the north by Tennessee and North Carolina. The state's northern part is in the Blue Ridge Mountains, part of the Appalachian Mountains system. The Piedmont extends through the central part of the state from the foothills of the Blue Ridge to the Fall Line, where the rivers cascade down in elevation to the coastal plain of the state's southern part. Georgia's highest point is Brasstown Bald at 4,784 feet (1,458 m) above sea level; the lowest is the Atlantic Ocean. Georgia is the largest state entirely east of the Mississippi River in land area. Even before 2003, the state had become increasingly supportive of Republicans in Presidential elections. It has supported a Democrat for president only three times since 1960. In 1976 and 1980, native son Jimmy Carter carried the state; in 1992, the former Arkansas governor Bill Clinton narrowly won the state. Generally, Republicans are strongest in the predominantly white suburban (especially the Atlanta suburbs) and rural portions of the state. Many of these areas were represented by conservative Democrats in the state legislature well into the 21st century. One of the most conservative of these was U.S. Congressman Larry McDonald, former head of the John Birch Society, who died when the Soviet Union shot down KAL 007 near Sakhalin Island. Democratic candidates have tended to win a higher percentage of the vote in the areas where black voters are most numerous, as well as in the cities among liberal urban populations (especially Atlanta and Athens), and the rural Black Belt region that passes through the central and southwestern portion of the state. A related case, Reynolds v. Sims (1964), required state legislatures to end their use of geographical districts or counties in favor of "one man, one vote;" that is, districts based upon approximately equal populations, to be reviewed and changed as necessary after each census. These changes resulted in residents of Atlanta and other urban areas gaining political power in Georgia in proportion to their populations. From the mid-1960s, the voting electorate increased after African Americans' rights to vote were enforced under civil rights law. Southern Congressmen have attracted major investment by the US military in the state. The several US military installations include Fort Stewart, Hunter Army Airfield, Naval Submarine Base Kings Bay, Fort Benning, Moody Air Force Base, Robins Air Force Base, Fort Gordon, Marine Corps Logistics Base Albany, Dobbins Air Reserve Base, Coast Guard Air Station Savannah and Coast Guard Station Brunswick. These installations command numerous jobs and business for related contractors. Since the 1990s, various hip-hop and R&B musicians have included top-selling artists such as Outkast, Usher, Ludacris, TLC, B.o.B., and Ciara. Atlanta is mentioned in a number of these artists' tracks, such as Usher's "A-Town Down" reference in his 2004 hit Yeah! (which also features Atlanta artists Lil Jon and Ludacris), Ludacris' "Welcome to Atlanta", Outkast's album "ATLiens", and B.o.B. 's multiple references to Decatur, Georgia, as in his hit song "Strange Clouds". Films set in Georgia include two pictures both set in Atlanta that were awarded the Oscar for Best Picture: Gone with the Wind (1939) and Driving Miss Daisy (1989). Other films set in Georgia include Deliverance (1972), which was based on the novel of the same name by James Dickey, and Parental Guidance (2012). Sports in Georgia include professional teams in nearly all major sports, Olympic Games contenders and medalists, collegiate teams in major and small-school conferences and associations, and active amateur teams and individual sports. The state of Georgia has a team in three major professional leagues — Atlanta Braves of Major League Baseball, Atlanta Falcons of the National Football League, Atlanta Hawks of the National Basketball Association — and in 2017 is scheduled to land a fourth with an expansion franchise in Major League Soccer.